It's no secret that Data was and continues to be the most consistently championed fan favorite character on TNG. But our beloved android extraordinaire is but one shining example of what the man who brought him to life on screen is capable of! 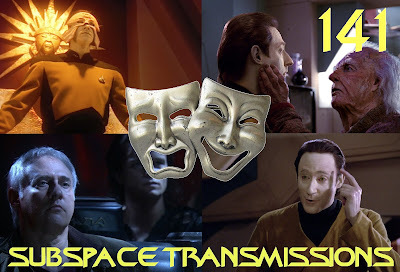 Thus, this week hosts Cam Smith and Tyler Orton, along with special guest Gena Orton, look beyond Data at the many other unforgettable Trek acting accomplishments of Mr. Brent Spiner. From his sinister, imbalanced work as the tormented Lore to memorable turns as prominent members of the Soong bloodline, we take a fun, enthusiastic tour through the great actor's CV in a concentrated effort to honor his iconic contributions to the franchise. Wanna appear on the show? Shoot us a 30 to 60-second audio clip telling us your thoughts regarding BRENT SPINER'S MANY TREK FACES and you could take the spotlight in an upcoming program! You can also send any other questions, topic ideas or feedback to subspacetransmissionspod@gmail.com! And you can also follow us on Twitter! Who is the Ultimate Star Trek Fighter? Join us next week as we welcome more iconic Trek moments into the canon! #140 - STAR TREK MOTHERS GONE AMOK!